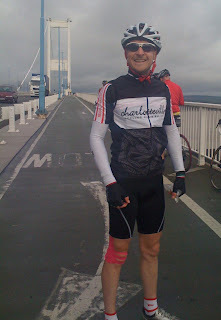 In late March I signed up to cycle from Lands End to John O'Groats as part of the Deloitte Ride Across Britain event. My good friend Nicola, was undergoing treatment for a rare head tumour at the Royal Marsden at the time, and to try and allay any feelings of being utterly useless, decided that raising money for the Royal Marsden was the only thing I could do. I am a keen cyclist but the Ride Across Britain event was quite an undertaking - over 960 miles in 9 days. I was one of over 600 who took part, cycling through some of Britain's best scenery. From the sunlit, saw-tooth profiles of Cornwall and Devon, flat(ish) but wet stages through Shropshire and the north west, to the windswept peaks of the Lake district and the epic grandeur of the Scottish Highlands. A knee injury on day 1 made the first 3 stages rather testing, but crashing at 20mph on day 5 made the rest of the trip even more of a challenge. (a note to all cyclists, always wear a helmet. My helmet did it's job, it cracked, my head didn't!) Getting up at 5.30 from a cold, wet tent, with gravel rash on my knee, hip, shoulder and hands wasn't fun. But that, and cycling 100+ miles in a day was an easy thing to do when compared with the operations and treatments that my friend and thousands of others go through. That thought spurred me on and kept my pedals turning until the finish line at John O'Groats. Sports Therapist/rehab specialist/personal trainer and cycling enthusiast from FINE FETTLE. If you would like to book an appointment for treatment with Jonathan please call 01372 458984 or email info@finefettle.org.